150 Years of the MAK – from Arts and Crafts to Design,” displays a cross section of a futuristic market: Google Glass promises augmented reality, mechanically transformed clothing takes shape through new lighting technology, reacts to sound, touch or the emotions of the wearer. The examples reside at the intersection of technology and style. 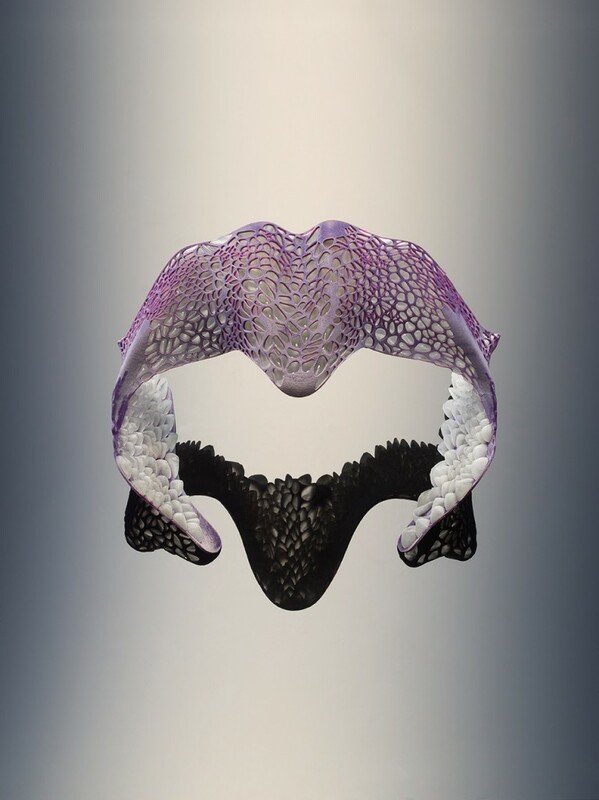 3D printing revolutionizes not only the manufacturing process of clothing, but also its aesthetics. These wearable “mythical” objects are based on computer models and were printed out in 3D on various multicolored materials. They have a futuristic aesthetic, but their formative use actually derives from biological structures. A specific functionality is achieved by the combined use of various hard and soft plastics (e.g. a harder outer shell, but soft material on the inside for a better wearing comfort). Visitors of the exhibition are invited to use the online participation platform – to comment on and contribute to this unique exemplary collection. More information at MAK.at and materialecology.com.